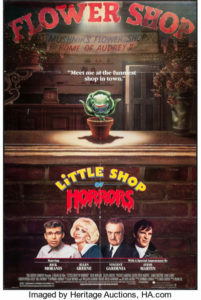 Episode 16: Little Shop of Horrors - A Reel Education: The Musical! 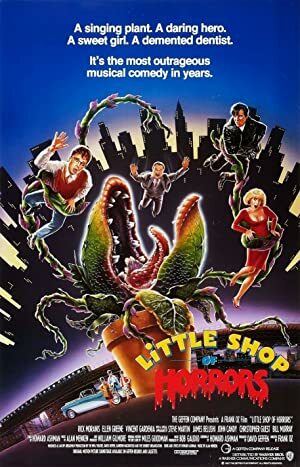 This week, Jazz Hams, all three of your hosts have seen the movie, so we brought in our first “official guest” (Jennie is more a silent partner than a guest) – Kaitlin Piraro – to watch that cult favorite LITTLE SHOP OF HORRORS. EDITOR’S NOTE: The intro sound quality (about 4 minutes) isn’t the best and we apologize. Things improve radically after the cut. We decided to show Kaitlin the director’s cut of the movie: the ending so unpopular with test audiences that only 13% of them thought it was a good idea. That didn’t keep Kaitlin from loving it – the music, the staging, the sets, and costumes. Director Frank Oz kept the ties to the off-Broadway stage very visible, and uses all his puppetry experience to make Audrey II a fully menacing and believable villain. Starring that adorable pokemon Rick Moranis and powerhouse singer Ellen Greene, plus a cavalcade of cameos, plus songs by Menken & Ashman, it’s delightfully dark entertainment. Having yet another set of opinions makes this episode super-sized, so grab a snack (doesn’t have to be meat, doesn’t have to be fresh) and take a listen! 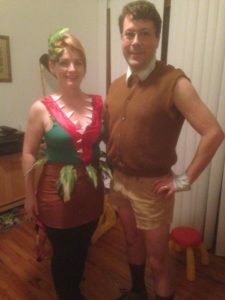 Dressing up as Audrey II and Seymour – totally healthy relationship! Plot: A nerdy florist finds his chance for success and romance with the help of a giant man-eating plant who demands to be fed.